It might take more twenty more years for the cabals to get hold of what is probably the most valuable land on the south coast, but the elites think in generations and they know that there are other foreign chickens to pluck until that time arrives. The elites own the courts and the government, so they have plenty of time. 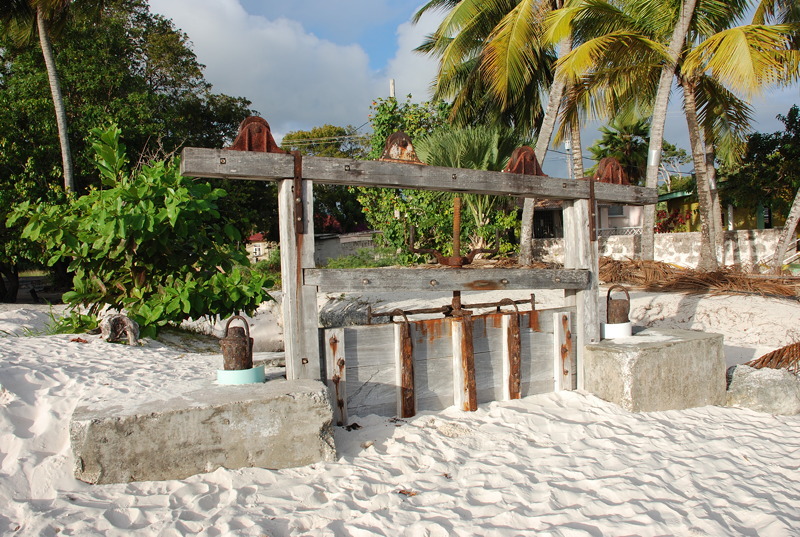 Above is a photo of the broken and blocked sea door to the Graeme Hall Nature Sanctuary. It should be opened once in a while to allow the mangrove swamp to be refreshed and to ‘breathe’ the sea water. Normally, tarpon would come and go from the mangrove swamp, the toxins would be diluted and the mix of of salt and fresh water (brackish water) would be perfect for the mangroves, fish, birds and animals of the swamp. 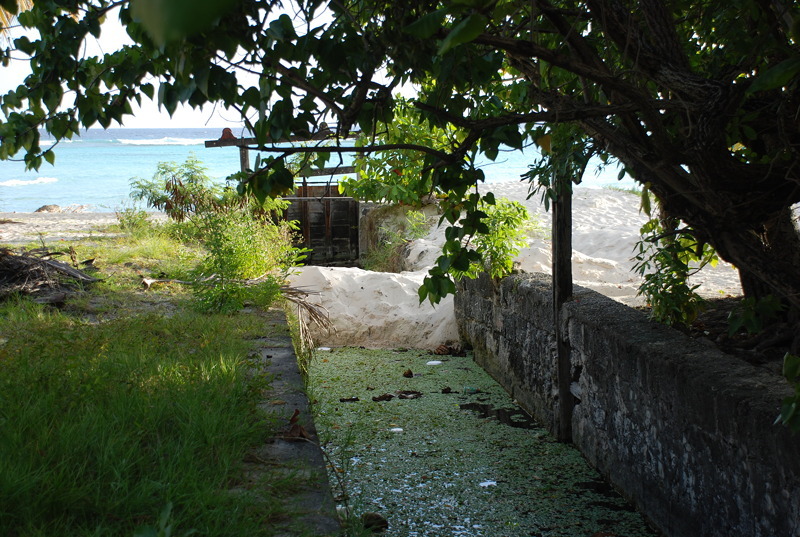 The government owns and controls the sea door, and for years kept it closed to deliberately kill the Graeme Hall mangrove swamp. The government has also refused to protect the natural area from sewerage discharges and industrial pollution – although all these assurances were given to the investor prior to his commitment to clean up and restore a beautiful natural resource that had been turned into a tipping dump. Nice people, those government types! The issue has been before the Barbados and the international courts but we don’t know the current status. We would appreciate an update from anyone who really knows. Meanwhile, here is the Wikipedia entry about Graeme Hall Nature Sanctuary. I visit Barbados on occasion and it appears to me that this article hits the nail on the head ! Why is the government opposed to this development of a nature reserve? Do they not realize once it is gone it is gone. On a purely financial basis it is a tourist attraction developed at no cost to the government. They want people to visit Barbados, but lets get rid of one of its attractions! I guess it is because by keeping it will only benefit the ordinary person and not line the pockets of the elite. Sadly the Facebook page(s) remain out-of-date. I requested to join the Group(s) but been totally ignored. Barbados is long overdue for a rebellion/civil war to eliminate the trash/corrupt politicians and take it’s rightful place alongside Haiti. Wily, you may well have a point! Definitely, the time is right and ripe to eliminate some crooked politicians as an example to the others. It seems to me that corrupt politicians and their cronies, administrators and the ‘authorities’ are endemic to the Caribbean islands. The problems arise when those Islands are dependent upon tourism to survive yet the corruption directly affects the reputation of those Islands as safe places. The issue of Graeme Hall Sanctuary / Ramsar Swamp is but one case in point. This issue has attracted world-wide condemnation. Its disgraceful that the Sanctuary was closed because the owner and staff cannot fight the Government’s deliberate dumping of polluting sewage into the Swamp. What does the Government want to do – turn it into a mosquito breeding toxic sludge lake ripe for filling in and concreting over for yet more hotels and condos to service the fantasy of St. Lawrence Gap? Dream on Government. Once the Swamp starts to smell of sewage and the mosquitoes start to spread disease it will be too late to save and people will suffer. And no-one will stay at the Gap when the Swamp smells like the sewage farm that it is rapidly becoming. And the other once beautiful Caribbean Islands? Jamaica hasn’t exactly got a squeaky clean image of being safe for Westerners. Antigua has had murders of Westerners and English Harbour is now patrolled by private security guards with machine guns FGS. I would never go to St. Vincent after the murders there and the incompetence (and greed) of the Government in building a resort and homes on a flood plain that – er – flooded recently, And I am also questioning whether I want to go to Barbados again with tourists being gunned down. If the Caribbean Islands want tourists to continue to visit, and importantly to spend their hard-earned tourist dollars, then they simply have to clean up their political acts and ensure that the ‘authorities’ keep everyone safe. Sadly greed will always prevail and the Islands and their peoples are condemned to suffer economically in these challenging times. In the 19th c. in the UK we had canals and rivers so polluted that disease was rife from the water in them. The pollution was industrial run-off, and deliberately dumped sewage into the stagnant (non or slow-moving) water. THIS IS MUCH THE SAME SITUATION AS THE BARBADOS GOVERNMENT IS INFLICTING UPON THE RESIDENTS AND TOURISTS AT ST. LAWRENCE GAP – INDUSTRIAL RUN-OFF AND DELIBERATE DUMPING OF SEWAGE INTO THE SWAMP. So in the 21st century – over 150 years later – the Barbados Government is deliberately creating an exactly similar situation at Graeme Hall Swamp. If nothing is done about the pollution being dumped into the Swamp – like the Bradford Canal; indeed like ALL of the canals and most of the rivers in the UK 150 years ago – disease will become rife in the area. Then it will be good bye St. Lawrence Gap as a tourist destination. It seems to me that the Barbados Government is acting just like the 19th c. profiteering textile mill owners who polluted the canals at the expense of the health of their workers and those living near them. And we all know where the textile mill owners got their money from – the slave trade. 150 years ago they couldn’t have cared less about their workers, just like the Barbados Government couldn’t care less about the health of today’s Barbadians in 2014. HAS NOTHING BEEN LEARNED??? BTW I understand that Peter Allard – Canadian owner of Graeme Hall – also offered to build a multimillion dollar hospital for Barbados. A hospital which would have been second to none in the Caribbean to treat all illnesses, cancer, HIV / AIDs, etc., etc. The Government also rejected his offer. Why? So glad to see someone writing about this! I always wondered what the heck happened to Graeme Hall and why it shut in the first place. The most pathetic thing of all?? That it’s a CANADIAN trying to preserve our BAJAN heritage!! Shouldn’t the BAJANS be the ones prioritizing this?!?! I get homesick studying overseas – but frankly I’m glad I’m not home dealing with the crap our government is doing! Many years ago I wrote Letters to the Editor on the issue of Graeme Hall Mangrove Swamp to our local newspapers, here are three of them and I know two got published. Have a read when you get a chance. Things like BFP and Faceook didn’t exist back then so maybe they can get better audience now than a decade ago. The destruction of this precious resource continues. Can anyone update us as to the legal machinations that are rumoured to be happening?